Since the fall of the apartheid regime in South Africa, the oft-made analogy between the South African and Israeli cases has been extended to suggest the applicability to the Palestinian quest for justice through the rights discourse, arguably the most effective mobilizing tool in the anti-apartheid struggle. 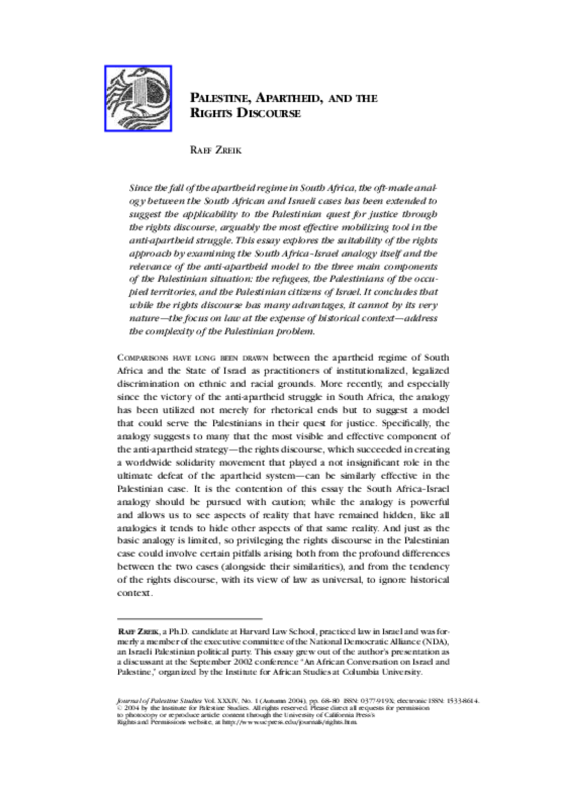 This essay explores the suitability of the rights approach by examining the South Africa-Israel analogy itself and the relevance of the anti-apartheid model to the three main components of the Palestinian situation: the refugees, the Palestinians of the occupied territories, and the Palestinian citizens of Israel. It concludes that while the rights discourse has many advantages, it cannot by its very nature -- the focus on law at the expense of historical context -- address the complexity of the Palestinian problem. Copyright 2004 Journal of Palestine Studies. All rights reserved.